2013 Honda CR-V 1.6 diesel review | What Car? 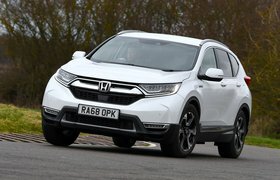 The latest Honda CR-V has always fallen short of the best SUVs, with its comparatively inefficient 2.2-litre diesel engine largely to blame. However, this new 1.6-litre diesel model looks far more competitive. It has a claimed average of 62.8mpg, compared with the 2.2-litre car's 50.4mpg, while CO2 emissions are slashed from 149 to 119g/km enough for a six-band drop in company car tax. What's the 2013 Honda CR-V 1.6 i-DTEC like to drive? You need to keep the engine spinning above 1500rpm, because it feels flat below this. Unfortunately, it also sounds very coarse when you rev it beyond about 2500rpm. Frequent gearchanges are required to keep the engine in this narrow window, so it's just as well the six-speed manual 'box (an automatic isn't available with the 1.6) has a slick shift action. The engine isn't the only thing that's been changed for this new diesel model. Honda has ditched the 2.2's four-wheel-drive system to save weight and maximise efficiency, and it has reworked the suspension in an effort to offer a sharper driving experience. Sure enough, the 1.6-litre model turns in to corners more eagerly than the 2.2 and resists body roll slightly better, although it still doesn't feel as agile as a Mazda CX-5. Comfort is a bigger concern. 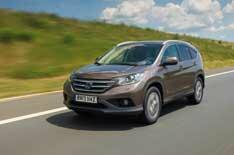 The CR-V has a distinctly unsettled ride and tends to jostle its occupants around over patched-up roads. This can get wearing on a long journey, which is a pity because tyre roar is well suppressed and the wind noise that enters the cabin at speed isn't overly intrusive. What's the 2013 Honda CR-V 1.6 i-DTEC like inside? Like any other CR-V, which means it has a spacious, five-seat cabin and a huge boot with a shallow lip. The rear seats are easy to fold, too, because you just pull boot-mounted levers, while the CR-V's big tailgate is surprisingly light (or electrically operated on EX-spec cars). You'll be less impressed with the standard dashboard layout; there are lots of buttons and switches to negotiate. However, the optional touch-screen sat-nav system makes things simpler, even if the graphics are rather basic. Build quality also seems good, but some people will struggle to get comfortable behind the wheel, because the backrest of the seat moves in fairly large steps that can leave you feeling like no position is quite right. Unless you really need four-wheel drive or an automatic gearbox, the new 1.6 diesel is the CR-V to choose, because it will be much cheaper to run than the 2.2 whether it's a private buy or a company car. The trouble for Honda is you can have the Skyactiv-D 150 version of Mazda's CX-5 for similar money. This has a much stronger engine than the CR-V and is better to drive, yet it returns identical CO2 emissions, and is every bit as economical and practical.